Kitchener councillors approved a new natural gas pricing policy this week that sets prices more in line with market rates. Kitchener Utilities, owned by the city, currently uses a blended system to buy natural gas, buying fixed-price gas on contract for up to five years and buying market or variable-rate gas when warranted. Its rates are set once a year. The city argued its blended method gave customers more price stability while minimizing risk. But councillors asked for a review of the policy after a public outcry arose in the wake of a Record comparison of customer costs between Kitchener Utilities and Union Gas, a private operator serving Waterloo and Cambridge that charges market prices. The comparison revealed the average Kitchener utility customer paid about $1,150 more in gas supply costs over the past five years. Kitchener Utilities' new gas pricing policy, which takes effect in July, is a "market responsive" approach that strikes a balance, said Coun. Dan Glenn-Graham, who moved the recommendation to change the policy. The new policy shortens the term for fixed-price gas contracts from up to five years to three. As well, it increases the proportion of market-price gas the utility buys. The new policy will likely produce prices for its customers that are closer to market rates, while still providing some price stability. City staff warned councillors, though, that a more market-responsive policy will mean customers are less protected from market shocks. Customers should see lower prices than under the previous policy when market prices are down, since the utility will be less locked-in to a long-term price. But customers will also likely pay a higher price than market when prices are on the way up. The gas price will be set yearly, as it is now, said deputy chief administrative officer Pauline Houston, "but the change from one year to the next may be a larger swing than it has been in the past." That swing could be either up or down. If the market continues to be as volatile as it has been in the past several years, rates could rise or drop by as much as 20 per cent a year. The policy will take effect once it's approved by council, likely next week, but customers won't see much change until 2015, Houston said, since the utility already locked in much of its gas purchases for next year under the old policy. City staff argued that customers still wanted to have some stability, based on the findings of a survey that found a majority of residents said they preferred stable rates. Customers weren't asked, however, if they were willing to pay a premium for that stability. Staff will review the new policy every one to three years. As nations rush to ship vast new stores of natural gas across oceans, the climate change implications of the fuel are coming under increased scrutiny. Perhaps nowhere is the debate so intense as in British Columbia, a province in western Canada where there are plans to export large quantities of natural gas to Asia. Environmentalists fear that the production and processing of the gas for export could upend the province’s aggressive climate change policies, which include an emissions-reduction goal and an unusual carbon tax system. It is difficult to know exactly how British Columbia’s natural gas boom will affect its climate goals and policies, although the province’s government has promised to develop the resource in the most environmentally friendly way possible. What is clear is that British Columbia is a case study of competing priorities — determination to battle climate change on the one hand, and eagerness to take advantage of a job-creating energy bonanza on the other. Shortly after the climate moves came into effect, a drilling technique called hydraulic fracturing unearthed new deposits of natural gas in British Columbia. Hydraulic fracturing, or fracking, deploys a mix of water, sand and chemicals at high pressure to release gas or oil trapped in rocks. Soon, the province’s fields began producing copious amounts of gas, and production rose about 40 percent from 2008 to 2013. But drillers had trouble selling the gas to one of their mainstay markets, the United States, because of a parallel American gas boom. So British Columbia began looking to export its surplus to Asia. Eager buyers are at hand. China, which is struggling with air pollution, is eager to find substitutes for coal in its power plants, and Japan wants replacements for nuclear power. Large companies lined up to build multibillion-dollar gas export facilities in the province. Thirteen such facilities are now planned, according to the provincial government, but not all are likely to be built. Drillers say that the world should welcome the boom, partly because it will help China move away from coal, which burns less cleanly than natural gas. Environmentalists counter that the calculus is more complex, because natural gas could take the place of renewable energy that nations like China and Japan also want to build. Environmentalists also warn of leaks from natural gas production and pipeline facilities, which can send the potent greenhouse gas methane into the atmosphere. Industry representatives say that British Columbia’s standards for reducing methane releases are already high. Much debate in British Columbia centers on the 13 facilities planned to export natural gas. These facilities transform natural gas into a liquid so the fuel can fit compactly onto ships. The process of liquefying the gas has two basic parts, according to Tom Rufford, a lecturer at the School of Chemical Engineering at the University of Queensland in Australia. First, the facilities remove contaminants such as carbon dioxide, hydrogen sulfide, butane and water. Then, acting like giant refrigerators, they cool the gas to minus 258 degrees Fahrenheit so that it becomes liquid. The liquefied natural gas, or L.N.G., then gets loaded into tanks for transport. The plants that liquefy the gas are generally powered by natural gas. The energy needed to remove contaminants and liquefy the gas can amount to roughly 10 percent of the energy contained in the gas produced by the plant, Dr. Rufford said. He added that the facilities were “very efficient to start with, compared to some other industrial processes,” like coal-fired power plants. Some environmental groups in British Columbia, such as Clean Energy Canada, want the facilities that liquefy the gas to use electricity derived largely from wind farms and local hydroelectric facilities for power, instead of mechanical energy and electricity from on-site natural gas-fired turbines. One relatively small proposed facility, called Woodfibre L.N.G., plans to use grid electricity rather than gas. But some in the industry say that using grid electricity — which in British Columbia is largely made from hydropower — is impractical. Greg Kist, president of Pacific NorthWest L.N.G., a proposed $11 billion liquefaction facility majority owned by the Malaysian oil and gas giant Petronas, said his project planned to use gas, rather than electric power from the grid, because of the substantial energy requirements of the plant and the time frame in which power is needed. “There’s very limited sources of power at that scope and scale in order to provide power for the facility,” he said. His plant would process natural gas that is relatively free of contaminants like carbon dioxide — one of several measures that will save energy, he said. The facility could begin construction next year. 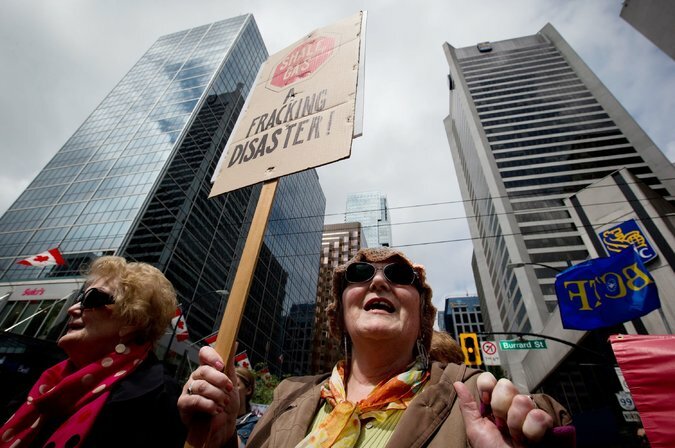 But gas producers say that British Columbia’s carbon policies will influence their efforts. “I think B.C. is and will continue to be a leader in many aspects of environmental policy,” said Dave Collyer, president of the Canadian Association of Petroleum Producers. Natural gas, he said, would fit into that framework.